My Life in Milton: Herring. No other food reflects my Russian heritage more than herring. When I think of my father, I think of herring. 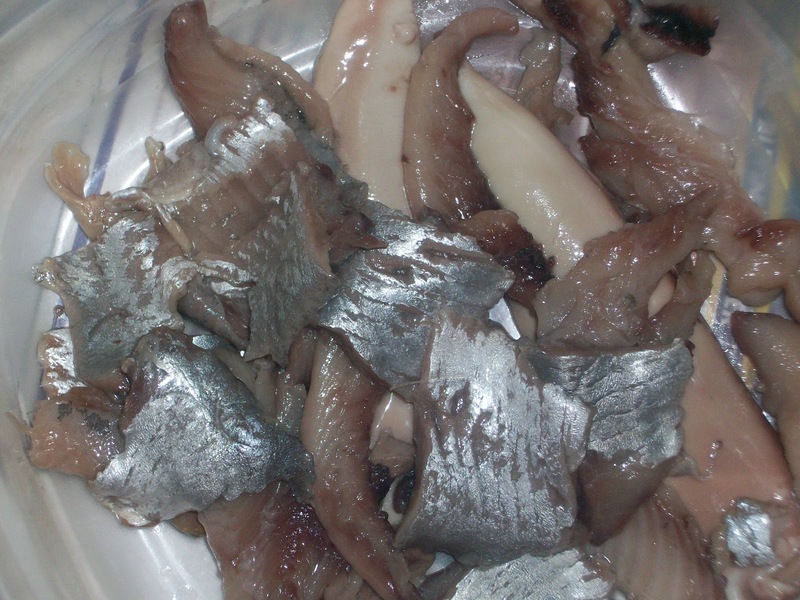 Now, you can find herring in sour cream sauce in most grocery stores. It's OK, but it's not herring the way I know it. Two kinds of herring are considered to be acceptable in my family. One is Matjes herring. This comes in small glass jars. 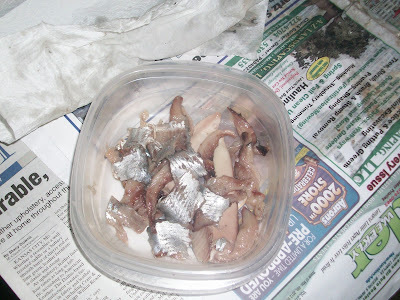 The other kind is the subject of today's post -- salt herring. If you live in New York City, you might be able to find headless salted herring in a big barrel in a deli. The container pictured above is the same white barrel with an orange lid container of herring that we used to be able to find at the A and P when it was on Market Street in Lewisburg where the Bull Run Inn is now. When the A and P closed, we were still able to find this herring at Macy's in NYC. When Macy's stopped carrying it, we were out of luck. And out of herring. It seemed as though herring was as lost to us as Papa was. But lo and behold, here comes a new thing called "the internet." I searched and searched for this product, til I finally typed in the key words that unlocked the magic again: Holland salt herring. And there it was. At Bavaria Sausage in Wisconsin. Available for sale online. 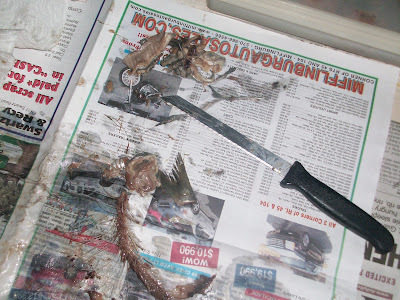 I eventually got the lid off the barrel of herring with the tools pictured. I finally had to use the snips to cut the lid off. The herring comes packed tightly, tails on, heads off. It lasts forever in the refrigerator. 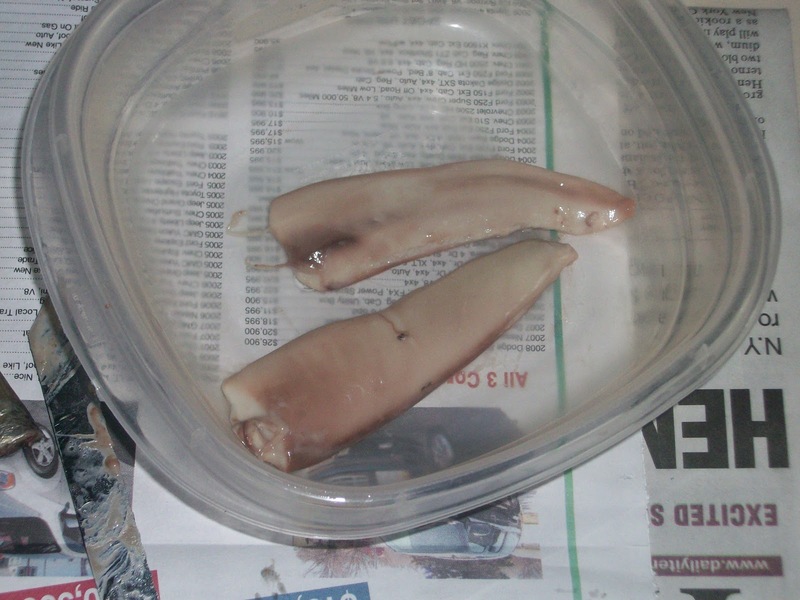 I decided to prepare three fish. The first step (after winning the wrestling match with the container) is to soak the herring. I soak mine overnight. You can soak yours longer if you want to remove more of the salt. Change the water several times. Next comes the messy part. I found a wonderful tutorial on how to prepare a salt herring. (I'll share some websites with you at the end of this post.) Although I had seen my father do it countless times, I had never before prepared herring. Get lots of newspapers, you're going to need them, and some paper towels, too. You will also need a sharp knife (a fish filet knife would be ideal, but I don't have one) and a container for the cleaned herring. First, cut off the tail. Then, very carefully, slit the belly to expose the roe sacks and entrails. Try to leave the roe sacks intact. 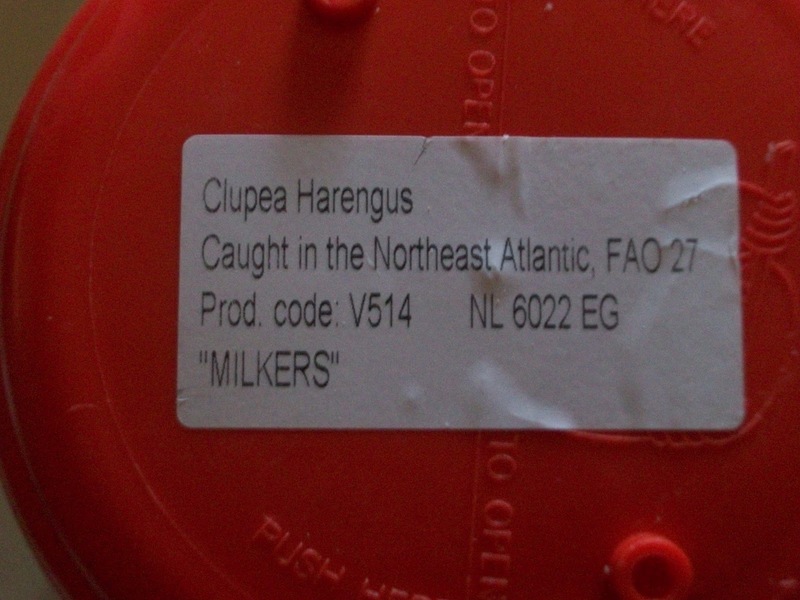 They contain the herring caviar. Carefully remove the roe sacks. They just pull out. 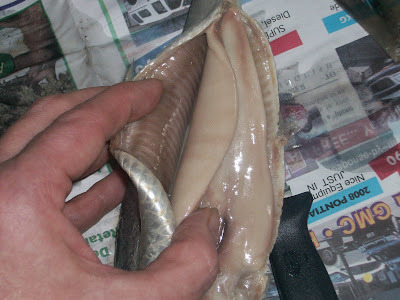 Clean all the guts off the roe sacks and out of the internal cavity of the fish. I like to run some water from the sink over them to make sure I remove all the guts. Here are the cleaned roe sacks. I like the caviar. My father did, too. My mother doesn't care for it. She likes other kinds of caviar like Osetra, Beluga, Salmon, and Lumpfish, but not the herring. (More for me!) I like to spread the caviar on bread with butter. The skin encasing the roe is a bit stringy. Next, place the fish skin side up on the paper. Press the palm of your hand firmly onto the backbone, flattening the fish. This greatly aids in removing the bones. Each herring has about a million small bones. OK, I exaggerate. It's really ten million. Now, carefully remove the backbone. Try to keep as many of the bones on the backbone as possible. 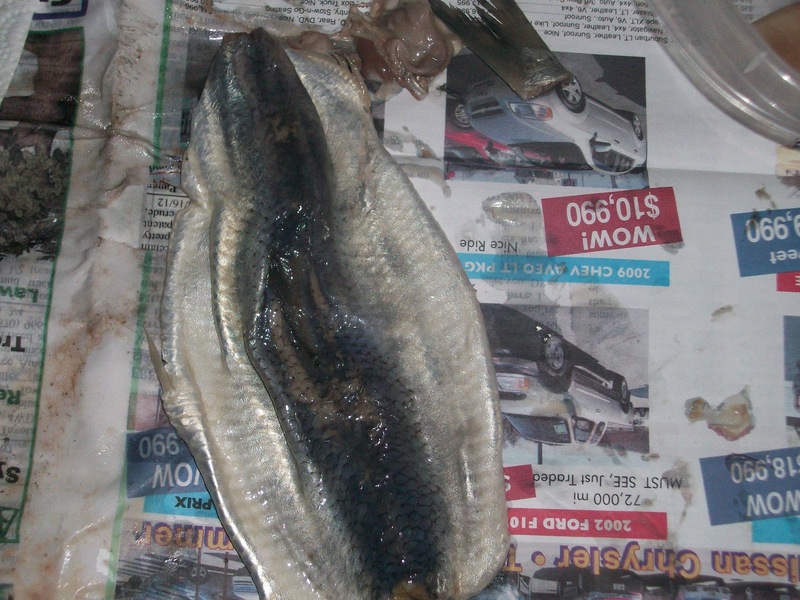 The herring tends to fall apart into three distinct pieces: the backbone and two filets on either side. Gently remove the meat from the backbone. 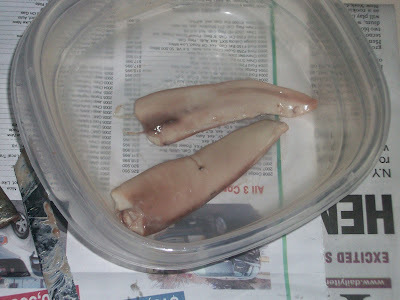 Then remove the skin from the filets. Be careful, or your will lose a lot of the meat. If the fish falls apart, that's fine. Just proceed with removing bones and skin from each section. You want bite size pieces. Feel each piece thoroughly for bones. Remove all the bones. It's no fun to bite into a nice bit of herring only to find a pesky bone. Guts, bones, tail and skin. I'll give some of the skin to my dog. This is how much you get from one fish. Here's a closer look. The darker rounded pieces are from the backbone while the silver flat pieces are from the filets. OK, two more to go, then I'll show you the recipes. Oh, yeah, I'll have those links for you, too. Wonderful memories! And there herring on buttered rye bread (no seeds) is a great treat.